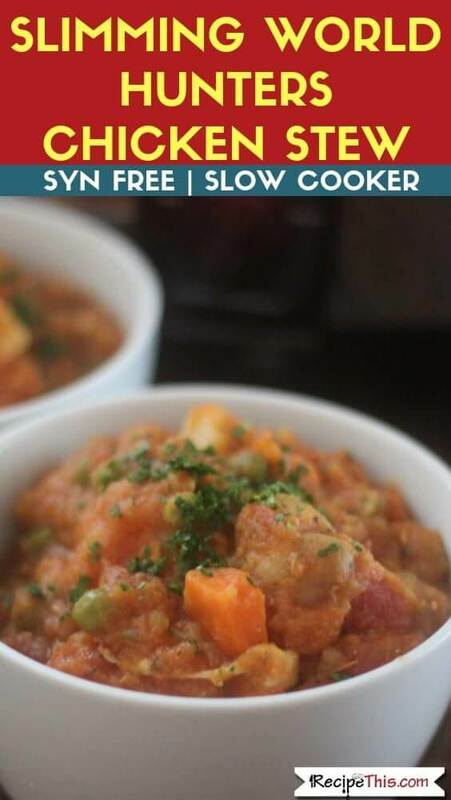 Syn Free Hunters Chicken Stew in the slow cooker. Enjoy a cheap family dinner of Hunters Chicken Stew in the slow cooker. Easy to prepare, perfect use of leftovers and incredibly filling. Now time for a confession. My Syn Free Hunters Chicken Stew happened by accident. It was never a pre-planned recipe but a recipe on a whim after a lot of leftovers from my Slimming World Hunters Chicken. Anyone that knows me well, knows that I am OBSESSED with saving money. My mum calls me a bargain hunter for the savings that I make and I love buying clearance food and getting a good grocery deal. Or Kyle my eldest son just calls me tight! I also love stretching food to 2-3 meals and that is exactly what I decided to do on a whim after making my Hunters Chicken. I realised there was going to be quite a bit of the Hunters sauce left over and decided to see how far I could stretch it. On the evening that we had Hunters Chicken for lunch we had Hunters Chicken Stew and then the evening the following day, I used the last of the spicy sauce to make a delicious bean chilli. Hunters Chicken Stew is very similar to a classic Hunters Chicken. Instead of just wrapping the chicken in bacon, it has a more deconstructed theme. You are cooking chunks of back bacon with diced chicken breast, then adding in extra vegetables and potatoes. It makes a much more filling meal and stretches it to feed a lot more people. Even after I had made my Hunters Chicken Stew for the 5 of us, there was still a spare portion for the freezer for another day. Slow Cooker Hunters Chicken Stew is so simple. You load the ingredients for your sauce into the slow cooker, let it cook, blend it with a hand blender until you have that classic Hunters Chicken Stew spicy sauce. After this you throw in the stew ingredients and let your spicy hunters sauce be transformed into Hunters Chicken Stew. Don’t forget if you have made lots and lots of Hunters Chicken Stew like we have, then batch it all up and freeze it for later! Hunters Chicken Stew is totally Syn Free and perfect for Slimming World. I often get asked what sauces to make that you can have on Speed days and this Hunters sauce is the perfect choice. If you’re on a speed day, simply swap the potatoes for butternut squash. As well as this you can cook our Hunters Chicken Stew and batch freeze it and then have it into ready to go freezer meals for whenever you need them. Perfect if you’re following Slimming World and the rest of your family is not. If you love our Hunters Chicken Stew, then you will love our other popular stews and casseroles that are cooked in the slow cooker. Turkish Beef Stew – This is another delicious stew in the slow cooker and just dump and go. Its also a little different compared the stews we normally eat. 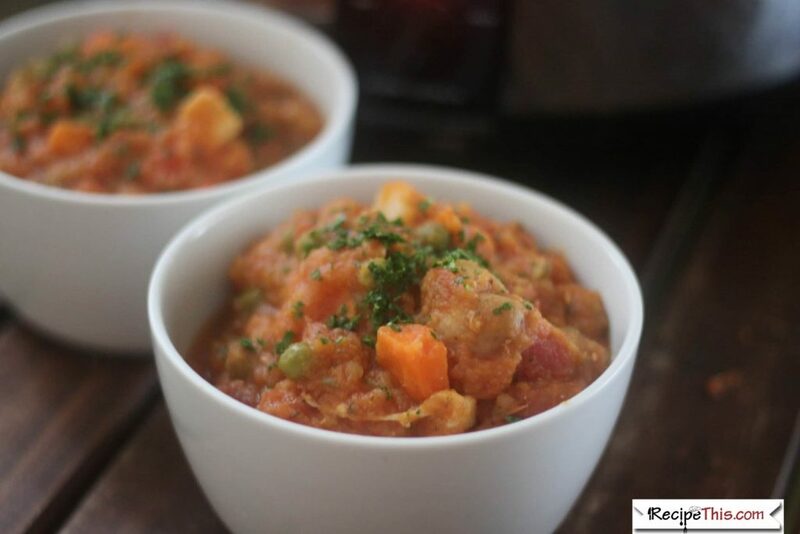 Beef & Pumpkin Stew – This is perfect for the winter months. Loaded with beef and pumpkin and full of healthy extras, I always have this in winter when I am feeling the cold. Brazilian Chicken Casserole – I am addicted to my Brazilian food and living in Portugal it is everywhere. This Brazilian Chicken Casserole is loaded with flavour and you will want some warm bread to dip into the sauce. Remove the core from the red pepper, peel the small carrots and dice the pepper, carrots and tomatoes. Place the vegetables into the bottom of the slow cooker and season well with salt and pepper and oregano. Cook for 4 hours on high in your slow cooker. Drain the liquid from the slow cooker, add all the seasonings, add the tinned tomatoes and using a hand blender, blend until smooth. Dice your chicken and bacon. Peel and dice your vegetables and pour them into your slow cooker along with your frozen peas. Cook for a further 2 hours on high or until your chicken and vegetables are well cooked. If you can use fresh tomatoes in your Hunters sauce rather than buying jars of tomato sauce. I added a sweet potato as it goes well with the paprika and cayenne pepper. You can call this your fridge raid and use whatever vegetables or potatoes you have left over. Add an old onion, some aubergine or even some butternut squash. Though avoid wet vegetables like courgette or ones that cook to fast like broccoli. For potatoes whatever you have is fine. I had some old potatoes that I peeled and diced as well as some newer new potatoes that I diced with the skin still on. 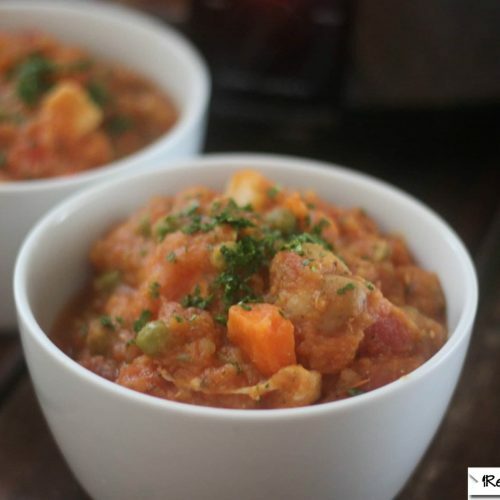 To keep this recipe Paleo and Whole30 friendly swap the white potatoes for more sweet potatoes or root vegetables of your choice. And swap frozen peas for spinach. When I am making this recipe its all about the leftover vegetables i have in. You can also use the sauce you have already made from your Slimming World Hunters Chicken to make this recipe and then just move straight onto stage 3 of the recipe.